As some of you may or may not know I made the decision of setting myself a real challenge to kick of 2016. I decided that in order to get the year off to a great start I would push myself to spend 10 days in Africa and 8 full days and nights in a tent on a mountain. As someone that doesn’t love heights, (Kilimanjaro is almost 6,000m above sea level which is almost 20,000 feet high) and has never slept in a tent before, (I wasn’t a boy scout what can I say), this was to be a real challenge in itself. 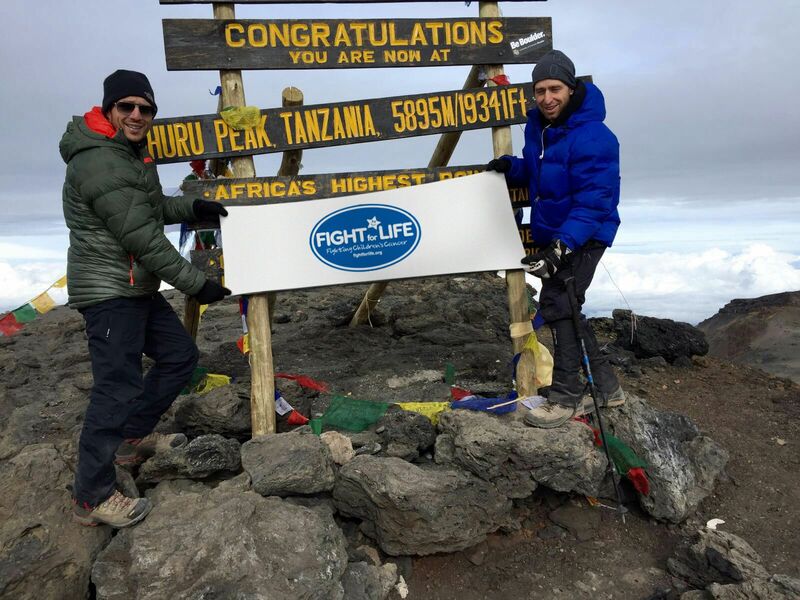 I had made the decision to get to what they call the roof of Africa in order to raise money on behalf of Fight For Life which is a charity that has always meant a lot to me, quite simply as it involves the most incredible and amazing children having to be the bravest they can be and a group of dedicated and exceptional people running the wonderful charity. An inspiration to all. However, as I was to find out sleeping in a tent on a mountain was to be the least of my concerns. Having touched down in Africa, with 18 of us in total, at Tanzania International, we picked up our bags. Although my brother, fellow FFL charity fundraiser and tent mate’s bags hadn’t arrived. Leaving the airport with only my equipment we journeyed to our hotel not too far away from the mountain itself. After our briefing and a final meal and sleep the bag arrived, phew! The next morning with minimal sleep and in a rush I had to spend what precious time we had left attempting to take out the equivalent of the weight of most people’s full bags in order to get my bag down to an acceptable size. It was after the second carrier bag of food that I realised that I may have over packed slightly! You can tell that I work at Elite. We loaded our water bags full of mineral water for the last time and headed off on the hour long journey to our entry point of the mountain. We were going to climb the Lemosho route of Kilimanjaro which would take 6 days up and 2 days down. We spent the majority of the first day waiting at the gate for the weigh in. Every single item was weighed from both us and the 70/80 of the crew that were taking us up the mountain. This crew included cooks, chaperones, porters, guides and even toilet monitors. My first and only panic happened after our three hour trek to camp one. Of all things my panic was not about the potential for altitude sickness causing death, or the four or five black spiders I found on the inside of my tent, or the mosquitos and monkeys around our camp but it was using the chemical toilet. I freaked out….. it was a battle between body and mind and I finally thought to myself I either do this or I don’t and that was the last feeling of concern or panic of the entire trip for me. For the next 6 days we trekked on average between 8-10 hours a day. Each day the terrain would change from what started as rainforest, progressed on to desert and eventually turned into terrain that resembled another planet. At each stop food was already prepared, tents erected and people were there at hand to help us with our bags and to provide us with a small bowl and soap for ‘washy washy’. On top of the exhausting trekking we would go to bed and unfortunately only have what is known as mountain sleep which is a little like lying awake and dozing. On top of this we would wake every couple of hours in need of the toilet due to the effects of altitude. This would not normally be an issue but on a mountain where at night it can be as cold as -30 it is necessary to get dressed, get a head torch on, boots on and get out of the tent with your heart racing at 100 miles an hour as if you had just run a 400m sprint and inevitably waking your tent mate up, it was not pleasant. Couple this with getting back in, undressed and your tent mate doing exactly the same ritual at least once or twice a night your sleep patterns are non-existent. Perfect after a nice 10 hour long exercise during the day. Each day brought new challenges whether it was me suffering from altitude sickness on the day of our quickest and highest ascent or others suffering in numerous different ways. It seemed the fitter you were the more you suffered. However it was a grind and the mountain was brutal. Tougher than I had ever expected; although not in the way that you would think. The mountain would wear you down slowly and as you became more worn down you would need even more energy than you had had before. You could go from terrible to fine on the flip of a coin. One day I felt like I was walking in a bubble or like a zombie in complete silence at no more than a foot at a time, feeling like I wasn’t going to be able to go on. The next day I felt incredible. That days trek included what was known as the Baranco Wall. We scaled the Baranco Wall, which was a climb rather than a trek and an extremely enjoyable experience. Reaching the top put us above the clouds which was an incredible feeling. On the final day of ascent we found ourselves in base camp where we would need to be ready for 11pm to leave for 12. We woke after 2hours sleep and left our base camp in complete darkness and freezing cold weather to walk the zig zag paths of sand that had frozen over to allow our climb. On 2 hours sleep we trekked steeply for over 8 hours to reach the first summit, Stella point at 5756m. We were exhausted but managed over an extra half an hour to slowly half a foot at a time drag ourselves the extra 150 m to Uhuru peak and the roof of Africa. The view and the surroundings were out of this world. Although I had managed to pass out between the two peaks and having altitude sickness move from mild to intermediate, only had time for a quick picture before being rushed down to a lower altitude. This took a further two hours for me as I was run down the mountain arm in arm with a guide. At the camp we had an hour to restock and eat some food before a four hour trek onto our next camp. So to sum that up that is a 5 hour trek, 2 hours sleep followed by a 15 hour trek which included reaching the summit! I was truly exhausted and there was to be no toilet breaks that night to disturb my sleep! The final day was all the way down, which had it’s own issues. I still have the black toe nail 4 months on to prove it. Typically the weather in the rainforest was true to type and the mountain decided to give us a final soaking on the walk down. When we finally reached the bottom, a meal awaited and knowing that we were only a coach ride away from a shower and other people was amazing. Not as amazing as the shower itself, which I could have stayed in for hours. There was so much more to the trip, whether the sky at night like you may never have witnessed, which seemed like it had been created with CGI or the terrain that would amaze every day. In order to complete the challenge you would need to dig deep and continue forward each day with a positive mental attitude, there was no room for doubt or fear despite the time you have inside your own mind. I really believe that we should all challenge ourselves both inside of work and out. Set the bar high and believe that you can achieve more than you think possible as you can achieve more than you would think and it all starts by taking the first step.